I thought the seats were actually comfortable but a little “thin” – as I’ve heard others mention before – not sure how they would stand up in a long trip. Knowing that US customers can’t currently get any different seats the seats could be a lot worse. The heat was nice and the cooling ventilation in the seats was okay. I didn’t get the feeling that the ventilation seats were blowing against my back – just my seat bottom. While I haven’t been a fan of the S-type sport buckets, I was looking for a little bit more support by having the seats hang onto me a bit more in the corners. I seemed to slide around a bit more than expected and I wasn’t really driving all that sporty. Bonus was that I received the wife’s “thumbs up” on the seats. I’ve had other cars get the thumbs down just because of the seats. I will say that getting in and out of the car seemed low and I felt that I was needing to step up and then out. The doors had oddly spaced detents in them so the door was either barely open (which I would keep scraping my shoes on the speaker grills) or really wide open (which in a parking scenario probably not very welcome). The back seats had a good amount of room and were just as comfortable even when the front seats were in a normal position. I expect the knee cutouts helped for those in the back. The electronics are clearly the highlight of Audi’s recent updates to their lineup and left me really excited with what was available. Starting with the the night vision – clearly this cool feature worked exactly as advertised. I loved seeing it in the console dash LCD monitor between the tachometer and speedometer (called the DIS – Driver Information Display). I also tried out the active cruise control that uses radar and a camera to keep pace at a variable distance with the traffic in front of me – perfect in stop -and-go traffic along with cruising on the highway. 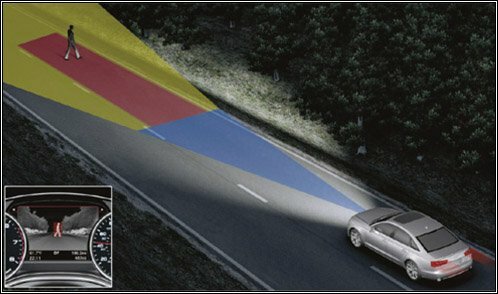 The lane departure technology components are limited in the US set of available options but do include blind spot detection. They’re quite useful in that LEDs in the mirror housing flash when the system detects vehicles in my blind spot. And depending on the traffic’s rate of approach, in the heads-up display as well. I’m glad to see that such technology is making it’s way into mainstream car markets – the experience was new to me. They work as expected and a welcome addition to actually turning my head and looking! 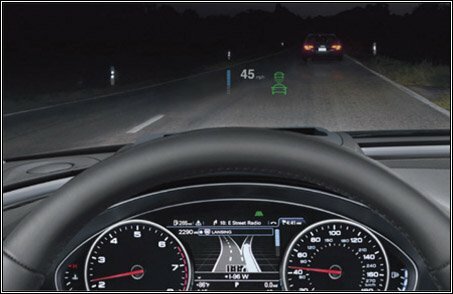 The new-to-Audi heads-up display (HUD) was really useful once I was able to get more than just the speed indicator to display. I managed to get the navigation’s turn-by-turn to display in there for a short while along with active cruise control and the side-assist notifications. Interestingly the map directions are visually displayed slightly different (the arrows and roads) than in the DIS – but still very useful. We have the HUD on our BMW X5 and the Audi system is much more colorful and graphically interesting. While just as useful in both, the X5 is mostly monochrome orange (I understand that some of the newer BMW 6-Series HUD are bring full-color to their HUD as well…) I’ve also read earlier comments on how ugly the actual HUD hardware is – essentially how it looks “added on” – but it wasn’t something I paid much attention to. The HUD mostly disappears from the drivers perspective but I did notice it from the side perspective, either from the passenger seat or simply entering or exiting the driver’s side door. The Google navigation was cool to see as the terrain was scrolling by but I’m not sure how much better it is after seeing it in action for a few days. I’ve turned that pseudo-feature off in our BMW X5 as it was more distracting than helpful and didn’t have the tremendous amount of detail that the Audi system has. I really liked the weather, traffic, gas prices, and news – as long as I had good 3G coverage. We got out into some outlier areas that switched to 2G and it was terribly slow to the point of being almost useless. I don’t think that’s specifically a T-Mobile issue (the cellular carrier that Audi selected to power this feature) – just an issue with 2G Vs 3G service. The MMI system pulls up those online systems in something of a mini Web browser which I scrolled to view. The system didn’t seem to cache any of the content so every time I’d revisit the information screens I’d have to wait a few seconds for the page to fill in. The rest of the MMI system was very responsive and I absolutely love the color DIS between the speedometer and tachometer. Brilliant and very useful – high resolution and very bright. The only gripe I have so far with the MMI system was that the turning of the selector knob seemed backwards. I really hope that have a preference the change that (I’ve heard that there isn’t… ugh…) I also found that the steering wheel controls for the selection of MMI content uses scroll wheels that also function as selection button. Every once in a while I’d go to make my selection and end up scrolling up or down one item just as I clicked it. Not a big deal as it may have been just getting used to the system. Oddly, I noticed that the backup camera seemed to have very, very poor resolution. This was the same viewing I saw in the A7 – just fuzzy and pixelated. I’m guessing a low resolution camera – but a little annoyance seeing as other backup cameras I’ve seen from BMW and Mercedes look better. And seeing the rest of the content on the display is detailed and crisp including the playback of video – it doesn’t seem to be a screen resolution issue. The last option to play with was the Bang & Olufsen sound system. I was really looking forward to having a go at listening to a $5900 option and was very pleased with the sound. However, I wouldn’t say I was blown away. My first test drive I used my wife’s iPhone to play back some music since I brought my demo music on a USB memory stick and the USB pigtail wasn’t included in the demo car. I did need to increase the bass & treble to get some semblance of punch and clarity from the system. I couldn’t spend a lot of time tweaking the volume and settings since my wife is not a fan of loud and/or bass heavy music. The second time around with the B&O I was able to get some of my own music played through the system and was definitely more impressed with the ability to reference music I was already familiar with. The natural request would be to compare it with the base sound system as well as the upgraded Bose option. Neither option was available in an A6 at the time I took my first and second test drives, however the dealer has since received more A6 demos with both options. In the meantime I did take a listen to showroom A8L with the optional Bose sound system and the B&O does sound quite a bit better to my ears. I would describe the B&O as having more stage presence, more aural excitement (without sounding processed) and essentially more clarity and separation throughout the full spectrum. The Bose seemed a little muffled but still had a decent low-end to it. Personally I’m not a fan of Bose systems in general and since in the end this is a car experience with all the road noise that goes along with it – it’ll be hard to tell if those listening tests translates well when I’m actually driving down the road. The demo car had the all-new full LED headlight package that includes Audi’s trademark LED daytime running lights (DRL). Notable in this package was that normal and high-beam headlights were LED as well (including the turn signals). Very cool to see in action as the turn signals are embedded within the swooped design of the DRL. It never got dark enough to actually use the LED headlights so I’ll save that feedback for a later review. I like the idea of bigger wheels – this model had the 19” sport package and I have to say not a real fan of how busy the spokes on that package looked. 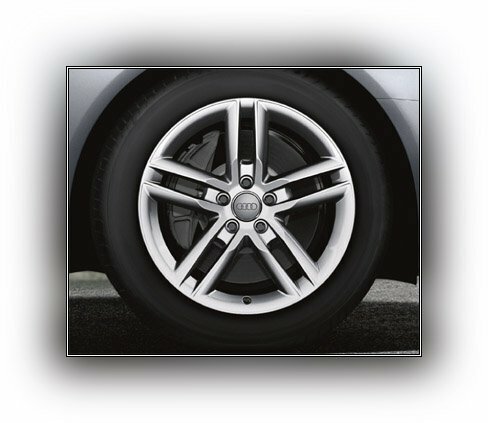 Perhaps that will change later on as currently there aren’t a lot of choices in wheel selections. I really like the double-V 18” wheels so I’ll have to wait and see them in person. One thing I was happy to notice was the absence of the “booming” road noise that I felt and heard in the A7 which had the 20” sport wheel package. While I’m also a fan of summer performance tires – I absolutely detest them in winter driving with snow & ice (exactly why they’re called summer performance tires). At the same time, there’s no way I’m going to deal with swapping tires for the privilege. I may just go with all-season and be done with it. There’s way too many “discussions” on the merits of tires for me to add anything useful – but I am looking for convenience. More thinking needed on that on which way to go. Engine and braking were pretty good. Both had a very smooth delivery and the bakes worked as expected. Not much noise, grunt or excitement – just driving at 60 mph with no real effort. The first time with the A6 it just felt like there wasn’t a lot of drama when dropping a few gears for passing maneuvers – it didn’t knock me in the back of my seat or punch me in the gut – but for highway driving, there’s plenty of power to get me where I need to go. The experience reminded me a lot of the BMW 335/535 in that sense. I might have been a little more aggressive in the road tests if I didn’t have passengers – I kept seeing my wife try and hold onto the door when I tried anything aggressive. I’ve since gone back and took a second drive with the A6 using the “Dynamic” mode from the Audi “Drive Select” configuration and it was actually a different experience. I believe I was actually using Auto or Comfort first time around which may explain some of the more lackadaisical feeling of performance. 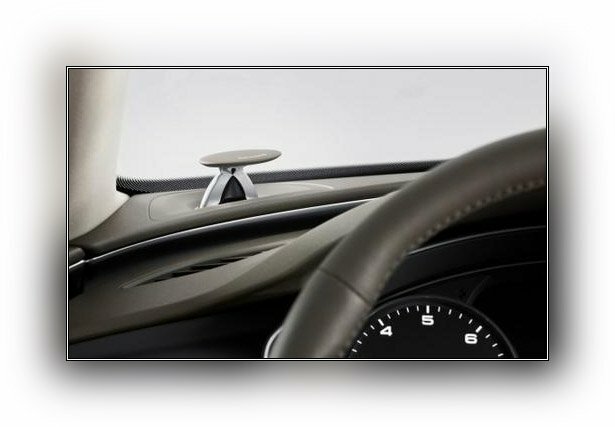 The Drive Select allows the drive to modify the driving and handling characteristics such that throttle, transmission, and steering are all adjustable. Handling was well controlled. I didn’t get the feeling of the front-end pushing at all. I can only refer back to my 300 HP Acura RL with SH-AWD that seemed to push out on hard corners – but not here. I wouldn’t say it was on rails or anything that dramatic – there’s not the sense of a completely flat turning experience – but still very well footed. There wasn’t an easy way to push the quattro all-wheel drive since it was mostly city driving and normal weather conditions. And when I did find myself with some twisting turns available, I started sliding in my seat. In the beginning I thought I had all my configurations settled on before I even test drove the A6. Prestige, Innovation, 18” Sport Package (I just like those wheels better), the B&O and perhaps the Cold Weather Package. Now after driving it the first time I walked away with only one thought on my mind – “It’s really nice”. But it’s not like it blew me away. The second time around I was more pleased with the car and some of my expectations were starting to be met. I will say that I struggled with this opinion of being “really nice” last year when I went on the lookout for an Audi S6 and test drove both an A6 and an S6. “Really nice” I said to myself again. 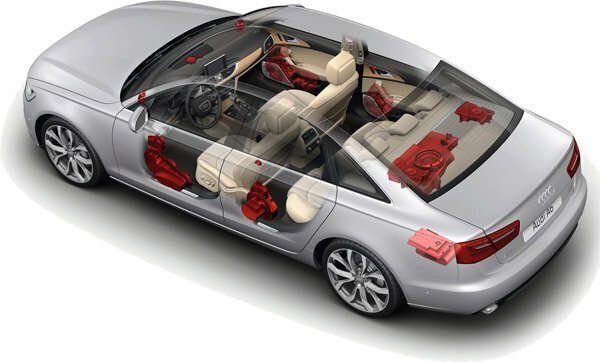 I also thought that the price range for an 2011 A6 seemed to be a bit inflated for the available technology and performance. (Thinking back – it’s possible that the demo car was setup more for comfort than for performance…) But as I try to wean myself off my 2009 Mercedes E63, I’m wondering if my expectations continue to be inflated and I end up letting myself down. The reasons for looking at the A6 are mostly for the all-wheel drive, technology, comfort, fit and finish, and a little bit of uniqueness. I certainly didn’t say “whoa” with a grin on my face after the driving experience (and to be honest, I didn’t say the same after the S6). But I also am under no delusion that this compares to an AMG car. Now towards the end of my decision process I have to consider if $15,000 in options makes the A6 fully loaded any better than the base A6. (Seriously – I have to love the German’s and their optioning of cars!) But now that I’ve built up my expectations on a fully loaded A6, I definitely need more time to think about the LED headlights, night vision, and the B&O sound system. And if those cool gadget items are removed – does the rest of the car still compete with what I’m looking for? We’ll see… right? I personally think that the A6 is a great car – but to me it appeals to the cognitive process in me rather than the visceral experience I have with my E63. I find myself reading through the same catalogs and forums and saying – whoa – that’s cool. Whereas with the Mercedes, I just have to start it up in my garage, listen to it burble a little – and then stomp on the gas and hang on. I’m excited for sure – but who knows… While being my first Audi, it probably won’t be my last car! Where is my Google +1 link? Like the review.. Since I started this post I thought I might wrap it up (from my perspective). I’m sad to say that my expectations to be a new Audi A6 owner ended on Saturday as I canceled my order with the dealer. A few things mentioned in some other threads led to this conclusion. Supplier issue led to a mid-November delivery date – best case. It’s possible other issues may come up but there surely wasn’t any emphasis on that date moving up. This specifically being the shortage of wood trim in all of the A6 and A7 models. Relationship struggles in communication and ordering between Audi of America, Audi of Germany, and the dealer made the buying experience sour over time. If this is what somebody has to deal with before getting a car I can’t imagine what after the sale looks like (which I’m very familiar with from other auto dealerships…) The dealer even mentioned that getting poor remarks on the customer satisfaction rating would make them not want to continue with the sale as there are costs associated with poor scores. I mentioned to them that they as the dealer have been very good to me – it’s Audi themselves I’ve been unimpressed with so far. The dealer says that the surveys don’t reflect on the parent company – just the dealership network. Sounds like a disconnect to me. The available seats in the Prestige are nice but after driving in them for an hour they got to be pretty uncomfortable. I routinely drive cross-state and the need for comfortable seats is a must. I already have ventilated seats in my current car and the A6 is comparable. They just didn’t have the support or adjustments needed. B&O was a fun yet expensive option. Some of my music sounded fantastic – other music sounded just okay. The value of that $6k option diminished the more I was in the car. There is bass in there along with clarity – but it’s dependent on the types of music you listen to. Acceleration and breaking were very good all the time. This demo had about 2,000 miles on it and it seemed to be a little quicker than when I first drove it with just a few dozen miles on it. It’s quick. Brakes are still a little touchy – but that would even out after getting used to the feel. All of the other technology started to fade away the more I stopped fiddling with it and spent more time just driving the car. The night vision was interesting but seemed to be less useful over time. Probably more of a focus issue as you can’t be looking in both places for long before you just become fatigued and turn it off. At least it’s in the driver information area and not on the NAV screen. Speaking of the color drivers information display – very colorful and informative – but again, once you just drive it becomes less important. Same for the HUD. Figured out how to keep some of the features up on display and the color was great. I did just find out that the BMW 5, 6 and 7-series all come with similar color displays in their HUD so that advantage is now moot. What I kind of found was that the technology and driving experience is a wow factor from the second I drove it and would most likely keep me entertained. But after a few hours – the newness started to wear off and I just settled into driving the car. In the end I would be waiting close to 6 months for a car that comes back to being really really nice. And there’s plenty of really really nice cars in this price range that I don’t need to wait so long for. With a little one on the way due at the same time as the expected A6 delivery time – I really don’t want that distraction. In the end, I couldn’t stress enough that if my car was actually built when it was supposed to I’d be all over taking that car home. The dealer is sending back my deposit and I’ve made the decision to head back to the BMW dealer where we bought my wife’s X5 last year – going with either a 535xi or a second X5 along with a Performance Delivery Center trip. Clearly those are my 2nd and 3rd choices but as I mentioned to my Audi dealer, there’s no ambiguity, less stress, we have a relationship with them as well, they’re eager for our business, and the car would be delivered in about a month. Knowing that historically I’m on my 11th car with a 3-4 year itch, it’s very possible that Audi will have some of these supplier and inventory availability issues cleared up. The dealer says they’ve been dealing with these situations for the last 2 years and are fairly fed up with the process as well. It’s a lose-lose situation for both of us. So for those of you that already have their Audi A6s or can wait 4-6 months – hats off to you and enjoy them! I’ll be revisiting that journey in a few years. That was really a great review and you have clearly mentioned all the functions of the car. I think Audi 2012 A6 is really good to drive and comfortable to travel in as well. The pictures of the car was really great and I think this blog will be use to people who want to buy a car like this one. Anyway, thank you for sharing this lovely blog with everyone and keep sharing blogs like this one.